“Gemeinschaftswerk” is a German word meaning “a collective endeavor.” When it came up during one of the presentations on my Study Tour to Berlin last week, I immediately took note of it. The speaker was using the word to describe a necessary aspect of the German transition to renewable energy; she was saying that every person in every corner of society must be involved if the transition is going to happen. Studying here, I’ve been inspired by so many examples of successful sustainability solutions resulting from collective action. Initiatives implemented by and for the people are the ones that last and promote social equality as well as “greening”. A sign at an eco-friendly business in Copenhagen reminds you to “vælge os” (“choose us”) by practicing sustainable consumption. But the concept of a collective endeavor is such an important one that extends far beyond my field of study. If we are to thrive on this planet together, we have to work together, and if we are to work together, we must care about each other. A “Needs and Resources Board” in a green space in Berlin. In Berlin’s Tiergarten, the Global Stone Project represents a unified world stepping toward peace through awakening, hope, forgiveness, and love. Even 4,043 miles away from the American capital, it’s absolutely impossible to be insulated from what is going on there. Almost every day I’m abroad, I have a conversation with someone – Dane, American, German, Nigerian – about the social and political climate in the U.S. The entire world can feel the deep divide, the impact of inexcusable rhetoric, the sorrow from so many decisions emanating from the U.S.; they want to know how I feel. This piece of art turns weapons into a symbol of peace in an especially multi-cultural neighborhood in Copenhagen. Most days, I feel completely exasperated and in disbelief. Many days I feel angry, horrified, and scared, especially for my friends living on the Pine Ridge Indian Reservation and elsewhere, for refugees, for people I do not know at all, for my future children. In Berlin, we spoke with a German woman, who was both an employee at a liberal political foundation and the daughter of a conservative coal miner, who said she feels scared, too. The rise of the xenophobic, anti-immigrant “Alternative for Germany” party has been a source of anxiety for many. Now, I don’t intend to pick apart the issues and impulses of the German right-wing, the similar Danish Peoples’ Party, nor any other political party anywhere in the world. Instead, I just want to share perhaps the greatest reminder I will take home from my travels – the understanding that there simply is no such thing as “us” and “them” and the conviction that we must refuse any notion like it. A meaningful message on the wall of a co-working space in Berlin. I think that perhaps the most important part of studying abroad is actually living among people who may not speak your language, who may not eat the same foods, feel the same way about taxes, believe the same things, or have the same sense of personal space and realizing, truly understanding, that they’re people, too. Just like you. Even on days when I could understand very little of the Danish or German or Swedish or any other of the many languages flying around me, I always recognized the look of worry on a mother’s face as she guided her toddler onto the metro. I saw the pained winces of the boy in the grass-stained jersey sitting across from me in the hospital waiting room, and I could imagine the neighborhood soccer league, just like the ones in my hometown, where he might have collided with another player. My grandpa tells stories with a glint of joy in his eyes just like the retired engineer at the museum did as he spoke to us about the history of wind energy. I can read the loving smiles of couples picnicking in the park. On Sundays, I had the incredible opportunity to worship at an international, intercultural church. In many languages, people with vastly different backgrounds raised their hands to praise the very same God. 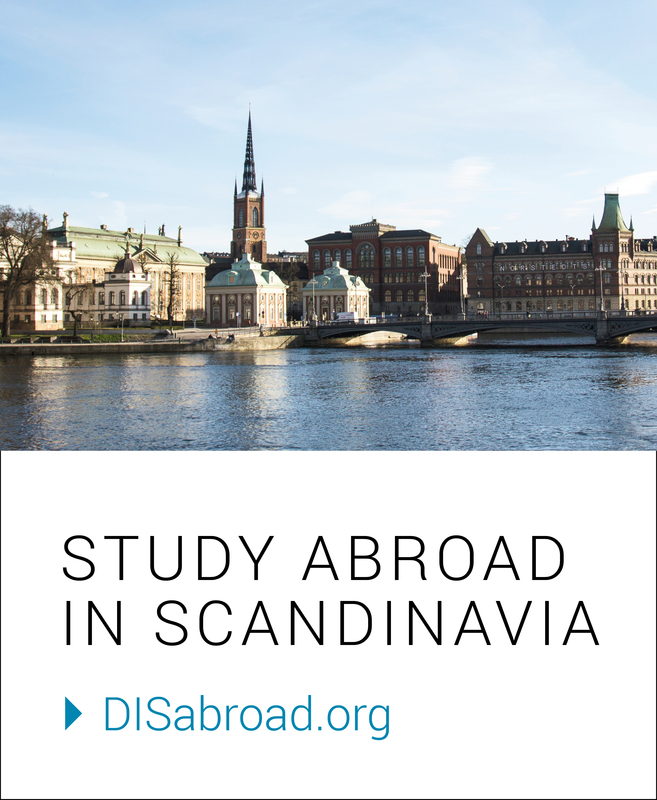 Now, of course, Denmark isn’t all that “opposite” from America, and there is quite a lot that’s especially comfortable about studying abroad here, even if it isn’t home. But in a world where the concept of the “other” seems to be increasingly inciting fear, we must jump at every chance to destroy the myth of “us” and “them”. There is only us. I encourage you to take any opportunity you can to expand your concept of “us.” Go abroad! Or maybe make a new friend, lend a hand, open up your home or your hometown. Living together, working together, being “us” is not just a better way to live – it’s the only way.